Lets do it! 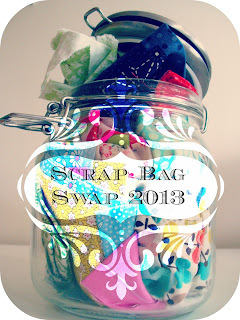 Scrap Bag Swap 2013 Are you in?? This is the sort of swap that is all about getting your creativity going not your stress levels (I've learnt what did and din't worked for me last year). One where all you need to do is sort out some cool offcuts from your stash to pop in a cute little handmade bag and post it off. Then, when your bag arrives be inspired by fresh new fabrics, do some small stash sewing and share your results on flickr. I guess its no secret that I love playing with fabric and colour, and I love using a fabric all up, its so satisfying getting your money's worth. The trouble is sometimes you've used a fabric in two or three projects and you still have leftovers - if you're anything like me you just get creatively stuck. 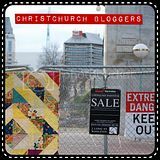 Maybe you want to extend outside your comfort zone of colours and prints you normally go for, or you just want to try something new - like appliqué or crochet with fabric scraps and really the cost of buying even 3 Fat quarters these days just to have a play makes you stop and think twice. I have a whole bunch of ideas for tutorials and I've managed to rope in a couple of friends and fellow bloggers to do 'guest' ones as well, so once sign up has closed I'll be running a little series of tutorials to whet your creative appetite. You'll be sending one little handmade bag of fabric scraps and offcuts to a swap buddy and receiving one from another. It's meant to be a surprise parcel, so please don't spoil the fun and contact your person/blog about them until you're sure your goodies have arrived. So - what is a scrap? I've hummed and harred about what constitutes a scrap - and really something as small as a postage stamp can be used but you're options are limited. For the recipient to have plenty of options (and fun) with your package, could your scraps be varied (rather than a whole bag of the same fabric) and most at least the size of a greeting card envelope or bigger - a mix of sizes is good. What about the bag? I mentioned a handmade bag. You can make whatever style of bag or receptical you like, but the point is to make something nice for the scraps to go in - a supermarket shopping bag is not what I mean! I posted a couple of tutorials and ideas last year (see the Scrap Bag 2012 tab up the top) - but something along the lines of a simple drawstring bag, or any bag design you could come up with/would prefer. Just have fun with it! Postage? 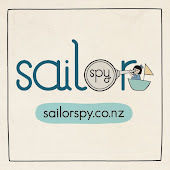 I will make this Antipodean swap (NZ and Australia), but please let me know on signup if you don't want to post across the ditch and I'll sort you out with a local. Send off a nice bunch of scraps in appealing fabrics that you would like to receive (but for the fact that you're sending stuff you have used heaps and want a change). This is not an opportunity to off-load old fashion, moth eaten fabrics or teensy tiny pieces of fabric that are no good to anybody. Can we just stick to quilting and crafting weight cottons and maybe some linen, wool felt or similar? You will see I've asked questions on the signup form about what sorts of things you have and what you would like so I can match you with someone suitable. Some of us like making little softies and bags and heavier weight cottons, linen and felt are great for that. Retro fabrics are also awesome - as long as the weighs are suitable for crafting and they are in good condition. Again, I've asked for your preferences in the sign up form - so don't worry if Retro isn't your thing - I'll line you up with more modern scraps. Simply pop over here and give me all your details on the signup form. Then be sure to sign up to the Flickr pool so you can share your photos, be inspired by others and refer back to tutorial picks. I'll leave this open until Sunday 3rd of February and get back to on or around Wednesday 6th February with the details of your swap person. I hope you can join me in this - lets inspire each other to make something amazing from little pieces of not much at all! I'm make a button for my side bar - feel free to grab it and spread the word. I'm in too! Your pins on pinterest inspired me! I really want to join but i would be a complete failure as a partner! No time at all for the next wee while - i will be in next time round though!